?Click through for 11 spot-on examples, and shop our curated selection at the end! 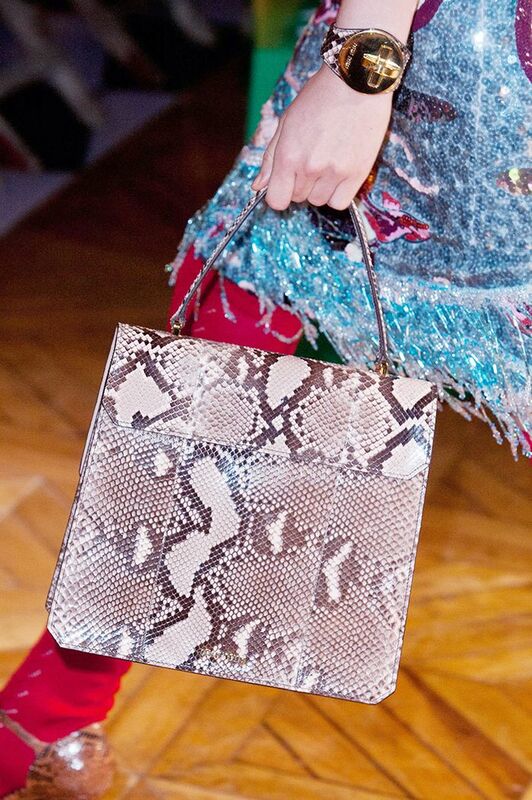 A snake-print tote with a short handle equals an adorable accessory we have to have now. Style Tip: Should you find yourself on a red carpet in the near future, a snake-print clutch in the same hue as your dress is a smart and stylish pairing. ?On Nyong’o: Stella McCartney dress and shoes; Chesneau Heltzel Minaudieres bag. Style Tip: Pair ladylike, python-print flats with black skinny jeans and an airy blouse for a feminine, chic outfit. Bonus tip: somehow get your hair to be as amazing as Aldridge’s, and your look is guaranteed to be golden. Style Tip: If you’ve caught on to the genius outerwear styling tip that is belting your jacket, then the idea of a python-print belt around your favourite tweed blazer probably sounds perfect, no? A python-print pump will always go with your favourite pair of blue jeans. Style Tip: Mix-and-match your python-print accessories with a furry coat and paisley blouse for an Almost Famous-esque outfit. Style Tip: Snake-print pumps are a great way to balance masculine-inspired separates. A jade, gem-embellished clutch won’t hurt, either. ?On Palermo: Stuart Weitzman Gemma Clutch ($695); Aquazzura Positano Elephe Snakeskin Pumps ($850). If you’re into turning heads, this bag should do the trick. Style Tip: Be adventurous and mix your python-print clutch with an animal-print dress — you won’t be disappointed. ?On Kerr: Just Cavalli dress; Roberto Cavalli bag. Style Tip: If you’re looking to take your python-print pumps out on the town, why not wear them with a lace crop top and pencil skirt? ?On Delevingne: Emilia Wickstead top and skirt. Don’t worry, we can’t stop staring either. ?Wear it with: a white t-shirt and light wash jeans. ?Wear it with: a breezy blouse and Bermuda shorts. ?Wear it with: your favourite trousers. ?Wear it with: a brown, leather tote bag! ?Wear it with: a pleated skirt. ?Wear it with: a white shift dress. ?Wear it with: a slim pencil skirt and short sleeve button-down blouse. ?Wear it with: a grey tweed blazer. ?Wear it with: a panama hat. ?Wear it with: black skinny jeans. ?Wear it with: a cargo shirtdress. ?Wear it with: a chambray shirt and white jeans. ?Wear it with: a white lace dress. ?Wear it with: your favourite LBD.